Episode 57 of Kīlauea’s long-lived east rift zone eruption was characterized by lava effusion and spattering within the crater at Puʻu ʻŌʻō that lasted from July 1 to July 20, 2007. This eruptive episode represented a resumption of activity following a 12-day eruptive hiatus on Kīlauea associated with the episode 56 intrusion and eruption near Kāne Nui o Hamo cone, uprift from Puʻu ʻŌʻō, on June 17–19, 2007. The withdrawal of magma from beneath Puʻu ʻŌʻō led to the collapse of Puʻu ʻŌʻō’s crater floor, forming a concave depression ~85 m deep. After the hiatus, episode 57 lava began to erupt from two vents within Puʻu ʻŌʻō, quickly constructing a lava lake and filling the crater to within 5 m of the precollapse lava level (25 m of the pre-collapse crater floor). Starting July 8, effusion waned as the crater floor began to rise. As uplift progressed, new vents opened along a circumferential fracture that accommodated the displacement. The bulk volume of filling within the Puʻu ʻŌʻō crater and flank pits during episode 57, including both surficial lava accumulation and endogenous growth, is estimated at 1.3×106 m3. This volume equates to a time-averaged dense rock equivalent accumulation rate of 0.6 m3 s-1, which is an order of magnitude less than the supply rate to the volcano at that time, suggesting that most of the magma entering the volcano was being stored. Eruptive activity in Puʻu ʻŌʻō ended late on July 20, and the floor of the crater began to subside rapidly. Shortly afterward, early on July 21, a new fissure eruption started on the northeast flank of Puʻu ʻŌʻō, marking the onset of episode 58. The June–July 2007 collapse and refilling of the Puʻu ʻŌʻō crater, culminating in a new breakout outside of Puʻu ʻŌʻō, illustrates the response of a long-lived eruptive center in Kīlauea’s East Rift Zone to an uprift intrusion. Variations of this pattern occurred several times at Puʻu ʻŌʻō before 2007 and have occurred again since. Recognition of this pattern has improved the monitoring capability of the Hawaiian Volcano Observatory and will aid in future eruption response efforts. 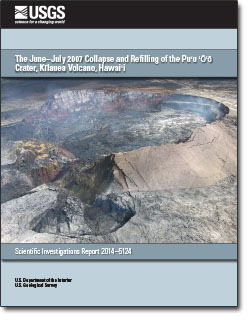 Orr, T.R., 2014, The June-July 2007 collapse and refilling of Puʻu ʻŌʻō Crater, Kīlauea Volcano, Hawaiʻi: U.S. Geological Survey Scientific Investigations Report 2014–5124, 15 p., http://dx.doi.org/10.3133/sir20145124.